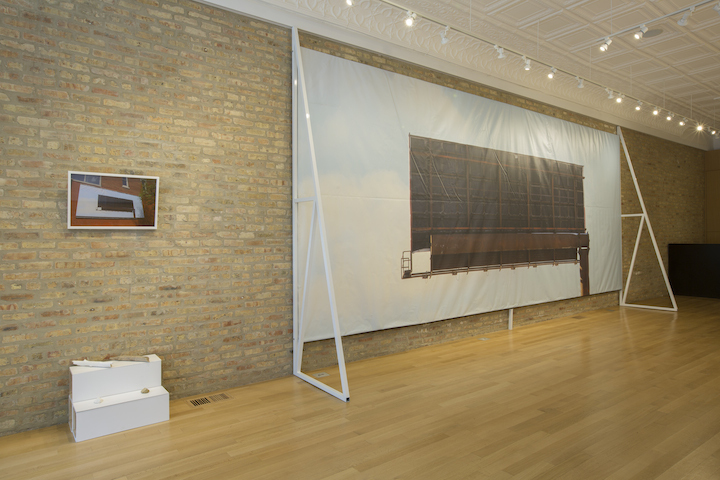 Installation View of Lindsey Dorr-Niro's "This Land Again"
Lindsey Dorr-Niro, “This Land Again,” Installation image, Sector 2337, Chicago, 2017. Photo by Clare Britt. Lindsey Dorr-Niro, “Untitled” 2017. Fluorescent lights, light gels, wood, paint, gravel, 10.25 x 3.09 x 4.58 feet. Photo by Clare Britt. Lindsey Dorr-Niro, “Untitled” 2017. Fluorescent lights, light gels, wood, paint, gravel, 10.25 x 3.09 x 4.58′. Photo by Clare Britt. Lindsey Dorr-Niro, 2017. Photo by Clare Britt. Left to right: Lindsey Dorr-Niro, Mountain Range, 2017, Digital Print, 25×19.12″; Plat/form 2, 2017, Wood, recycled tire flooring, 6x10x3’; Stage, 2017, Digital Print, 25×19.12″. Photo by Clare Britt. Left to right: Lindsey Dorr-Niro, Stage, 2017, Digital Print, 25×19.12″; Untitled, 2017, Looped video, 14min; Void Inverse, 2017, Digital Print, 14.37 by 20.50”. Photo by Clare Britt. Lindsey Dorr-Niro, “Screen” 2017. Aluminum, plastic, tape, 5.33 x 9.50 feet. Photo by Clare Britt. Installation View of Lisa Vinebaum's "New Demands?" Lisa Vinebaum, “New Demands?,” Installation image, Sector 2337, Chicago, 2017. Photo by Clare Britt. Lisa Vinebaum, “New Demands? THERE COMES A TIME WHEN SILENCE IS BETRAYAL,” 2017. Custom cut vinyl window installation, 45×91.25 inches. Photo by Clare Britt. Lisa Vinebaum, “New Demands? SUPPORT EACH OTHER IN RESISTING HATE,” 2017. Custom cut vinyl window installation, 45×91.25 inches. Photo by Clare Britt. Lisa Vinebaum, “New Demands? UNITED WE BARGAIN DIVIDED WE BEG,” 2017. Custom cut vinyl window installation, 45×91.25 inches. Photo by Clare Britt. Lisa Vinebaum, “New Demands? YOU TOO CAN JOIN,” 2017. Custom cut vinyl window installation, 45×91.25 inches. Photo by Clare Britt. Lise Vinebaum, “New Demands? THE MONSTER OF FASCISM IS UPON US,” 2017. Custom cut vinyl window installation, 74.5 x 104 inches. Photo by Clare Britt. Lisa Vinebaum, “New Demands: In Union We Are Strong,” 2017. Neon, 24 x 29 inches. Photo by Clare Britt. Installation View of Edra Soto's "GRAFT"
Edra Soto, GRAFT, 2017. Installation view, Sector 2337. Photo by Clare Britt. 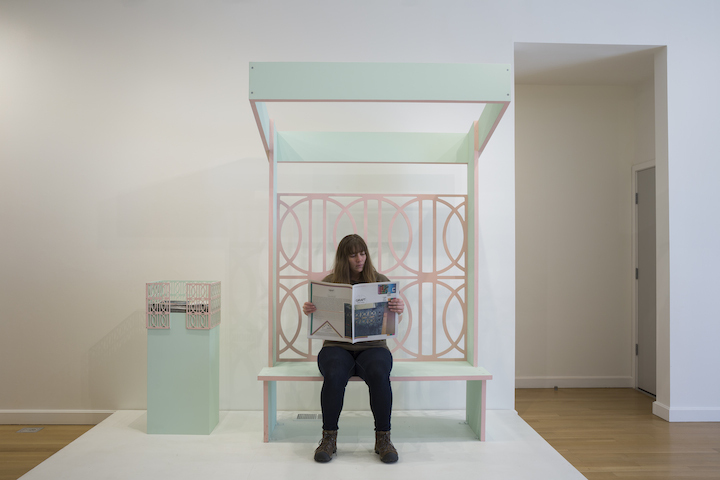 Edra Soto’s installation on view at Sector 2337 includes two newspaper bins with two different tabloid-style publications. These bilingual, newsprint editions include essays, poems, and visual contributions from a variety of participants that use their various backgrounds to reflect upon Soto’s work. Designed by Sonnenzimmer, participants include Dorothy Bell Ferrer, Cristina Correa, Christopher Cozier, Rafael Franco, Alison Fraunhar, Jefferson Godard, Daniel Hojnacki, J. Anna Looney, Anansi kNOwBody, Jesus Mejia, Daniel R. Quiles, Xuxa Rodriguez, Teresa Silva, Albert Stabler, Andy Sullivan, and Carolyn Supinka. While Part I is currently only available at Sector 2337, Part II is available here. “…Now in their second year, the 4-day festival took place at Sector 2337 and Links Hall, December 7-10, 2016, highlighting cross-disciplinary work that expands approaches for performing poetry. Co-programed by Devin King and Patrick Durgin, the festival included traditional poetry readings and new-media performances that incorporated interactive software, digital video, and sound. Sector 2237 regularly showcases performance art, literature, translation, visual art, and music with both experimentation and sophistication. They tap into a highly specific, thriving community in Chicago—particularly those engaged in multiple disciplines—that previously lacked a platform. Sector 2337 encourages audience members to apply their artistic tools in the real world; they combine community building and auxiliary programming in a politically active way.